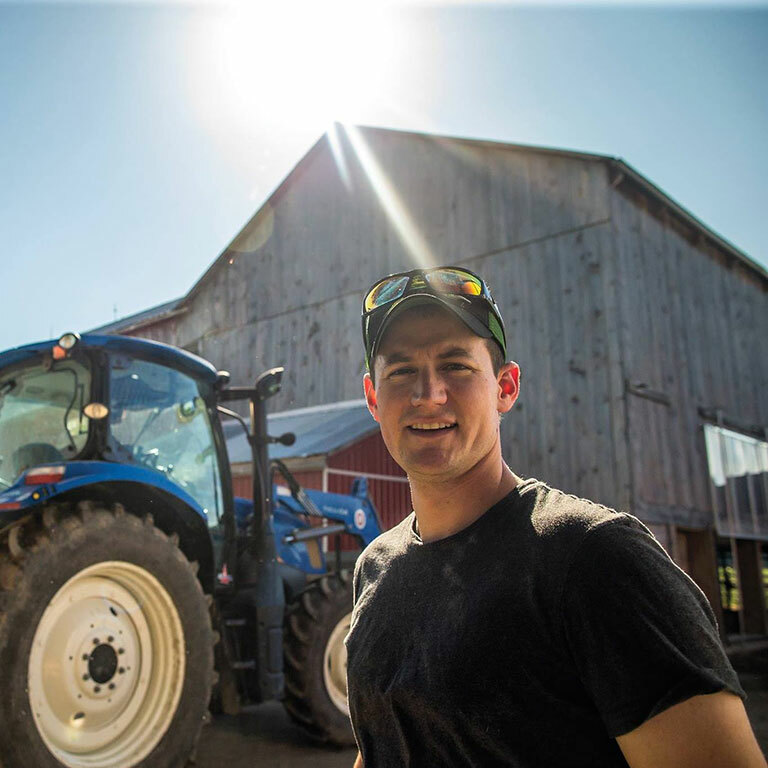 MEET ANDREW CAMPBELL Andrew is a third generation farmer from Southern Ontario, milking Holsteins and growing corn, soybeans, wheat & hay at the family farm (Bellson Farms). After his campaign in 2015 to send out a picture a day via Twitter to show life on the farm (#Farm365), he’s now visiting a farm a week across Canada to show where our food comes from. Follow us weekly as we share Andrews’s videos and give you a glimpse into the life of dedicated and hard-working farm families. The folks at Salford Group know a thing or two about building farm equipment. They've been in the business for four decades, building things like cultivators to till soil, spreaders for applying fertilizer and more. Come along for a tour with Geof & Anson to learn how it is done, and all the types of people it takes to make it happen. Watch Andrew as he meets Carrie Woolley and discusses how sheep are raised on apple orchards. Watch Andrew as he meets Jake Pelissero and his flock of laying hens. They discuss what is involved in taking care of his hens, and where you might find his eggs. Watch Andrew as he meets Jan and his 22 acres of cucumber farm. They discuss the growing process and the pros of greenhouse growing. Watch Andrew as he meets Anna and her heard of meat goats. They discuss daily routines on the farm as well as the goat meat market. Watch Andrew as he meets Matt and his broiler chickens. They talk about climate control for the animals as well as what technology is used. Watch Andrew as he meets Greg and his purebred cattle. They discuss daily tasks to care for the animals and the subject of beef sustainability. Watch Andrew as he meets Roger and his Bison Farm. Andrew and Roger talk about the growing popularity of Bison steaks & burgers as well as what the day to day tasks include for caring for the animals. Watch Andrew as he meets the McLachlan brothers and their maple syrup farm. Andrew learns about what it takes to make maple syrup and takes a tour of the facility. Watch Andrew as he meets a family who milks cows for a living. Get a glimpse of the daily routine on a dairy farm as well what happens when one of the cows gets sick. Watch Andrew as he meets Erik & Hayley who are first generation dairy goat farmers. Learn what the daily tasks are for goat farmers as well as what 'kidding' is.